A s you may have already read, the longstanding claim that Nicolas Rieussec invented the chronograph has recently been disproven after facts came to light that actually prove Louis Moinet’s invention 5 years earlier (1816) was truly the first chronograph. Needless to say, the history of the chronograph is not a clear-cut subject, and the history of the first automatic chronograph is no less confusing. In fact, it is actually even more confusing, as there are numerous companies who claim to have invented the first (self-winding) chronograph. In 1969, three automatic chronographs were introduced: the Zenith El Primero, the Seiko 6139, and the Caliber 11 (produced in partnership with Heuer, Hamilton/Buren, Dubois-Depraz, and Breitling). To this day, it is disputed as to which of these aforementioned brands launched first. However, what we can determine is that Zenith produced one of the first two integrated automatic chronographs ever (as the Caliber 11 is a module based chronograph), and Zenith publicly announced their self-winding chronograph before anyone else. So as far as which chronograph was announced first, it was Zenith. And they are true to their name “El Primero” which means “The First,” in that regard. As far as which chronograph was available commercially first, that is a different story as the Caliber 11 did, in fact, go on sale before the El Primero. For this review, we compare not one, but two brand new Zenith El Primero Chronographs. A 42 mm El Primero 36,000 VPH and a 38 mm Zenith El Primero 36,000 VPH Original 1969. The latter is listed on Zenith’s website as a ladies’ model, although, we know that some men prefer the smaller models and it is not even a point worth arguing about. It is really a matter of personal taste as to which size you prefer. The dials of the two El Primeros we reviewed are very similar, although there are a few minor differences worth noting. The dial on both El Primeros is silvered with multi-colored subsidiary dials in blue, light gray and dark gray. One of the most noticeable differences between the two watches is the space in between the sub-dials and the perimeter of the dial. If you look at the (1st slide above), you can see that the 42 mm dial (on the left) has more space in between the sub-dials and the black minute track in comparison to the 38 mm model on the right. As far as the look of the dial, we think the 42 mm dial is better balanced, but the 38 mm is not so different that it really matters. For those of you interested in the technical aspects of the chronograph configuration, it is an integrated chronograph with a column-wheel and horizontal clutch. Another big difference between the two models is the position of the date aperture. On the 42 mm it’s located at 6 o’clock, and on the 38 mm it’s at 4:30. Some other minor differences are the markings on the dial, the 38 mm chronograph hour counter (at 6 o’clock) has “Automatic” written in the center, whereas the 42 mm version has nothing written. And other than that, the writing under the “Zenith” on the dial of each model is slightly different. 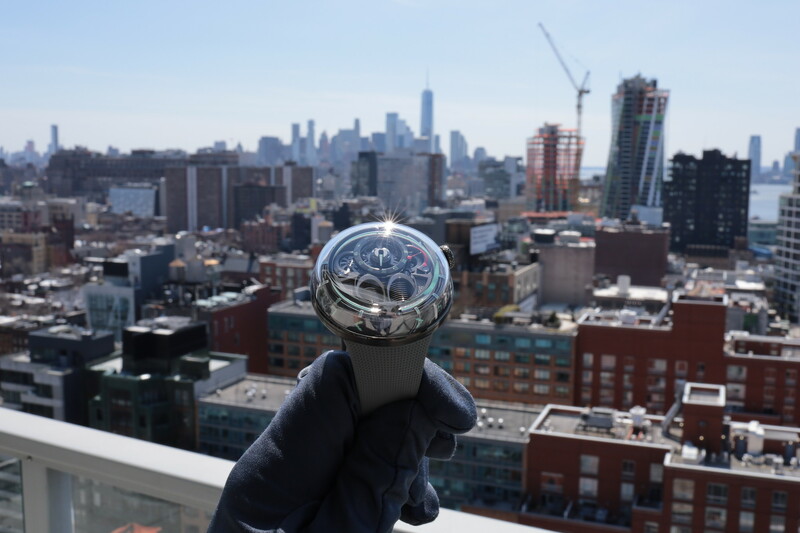 The hour and minute hands (with luminous treatment), red central seconds hand with star counterweight, applied indexes (with luminous treatment), tachymeter scale and minutes track are all the same. Inside each timepiece, is, of course, the famous high-beat El Primero movement that runs at 5Hz or 36,000 VPH. And while each watch has a caliber that measures 30 mm by 6.6 mm, the movements are actually slightly different. The 42 mm El Primero uses a 400B caliber and the 38 mm uses a 400 caliber. The 400B has 326 components, whereas caliber 400 has only 278 components. The difference is in the location of the date window. The movements may be the same size but due to the positioning of the date in relation to the case size, the number of components varies. Finishing of the movement includes circular graining on the bridges, blued screws and a skeletonized oscillating weight with Geneva stripes. For those of you interested in the technical aspects of the chronograph configuration, it is an integrated chronograph with a column-wheel and horizontal clutch. The power reserve is 50-hours. The 42 and 38 mm El Primero cases have the same signature shape. They both have a brushed finish on the top of the lugs, with mirror polished flanks, bezel, and pushers. Both have a box sapphire crystal. Same pump style pushers. And the same style crown. As far as the cases, the only differences are the dimensions. The 38 mm is smaller in diameter, obviously, but it is also slightly thinner at 12.70 mm versus the 42 mm model which is approximately 13.34 mm thick. The big difference as far as wearability, is the length, which is about 46 mm on the smaller model and 50 mm for the larger model. The other dimension that varies is the crown size, the smaller El Primero naturally has a crown with a slightly smaller diameter, although the difference between the two is only about a half of a millimeter. Crafted of stainless steel, polished and embossed with the Zenith star is the ridges push-in crown, that is easy to use without being too large. 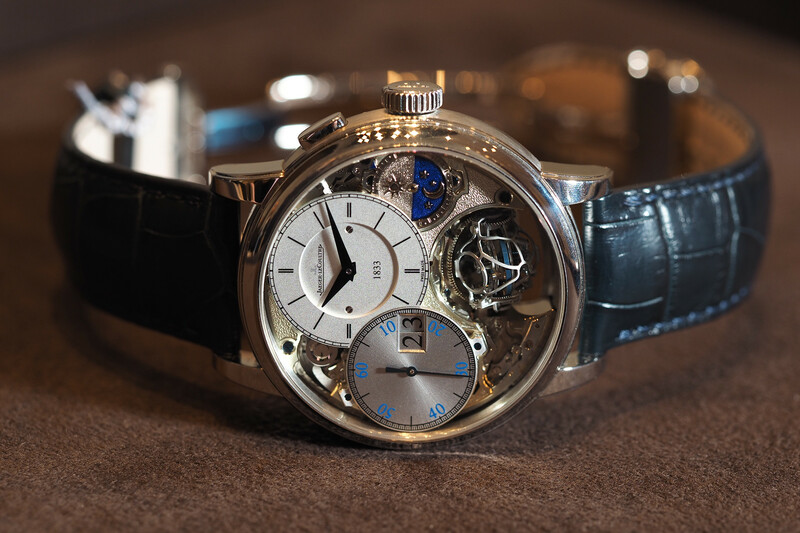 A steel caseback that is polished and has a sapphire exhibition window is secured by 4 screws. Water-resistance is 100 meters. The 42 mm El Primero comes on a black alligator strap and the 38 mm El Primero comes on a dark brown alligator leather strap. Both have polished and satin-brushed folding clasps with buckles with embossed Zenith star. Retail is price $8,300 for (Ref. 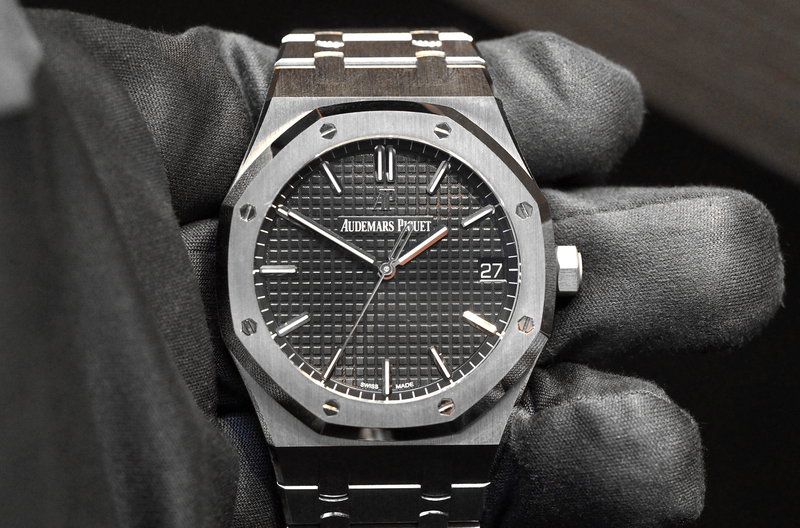 03.2150.400 – 38 mm) and $8,500 for (Ref. 03.2040.400, 221294 – 42 mm). In conclusion, both the 42 mm and 38 mm El Primeros feel very comfortable on my wrist (which is 7” around), and have a great modern look, along with some DNA from the original. The 42 mm model’s dial is a bit more balanced with the date at 6 o’clock and with more space in between the subsidiary dials and the chapter ring. In contrast, the 38 mm El Primero’s dial seems a bit compressed, specifically the amount of spacing between the counters and the perimeter of the dial. With that said, the 38 mm is also a bit thinner, and a few hundred bucks cheaper. Not to mention, for purists like myself, it has proportions that are more in line with my current tastes. A 42 mm diameter case is by no means an oversized watch, in fact, it is one of the most common men’s case sizes nowadays, I just personally prefer a more conservative case on this type of watch. 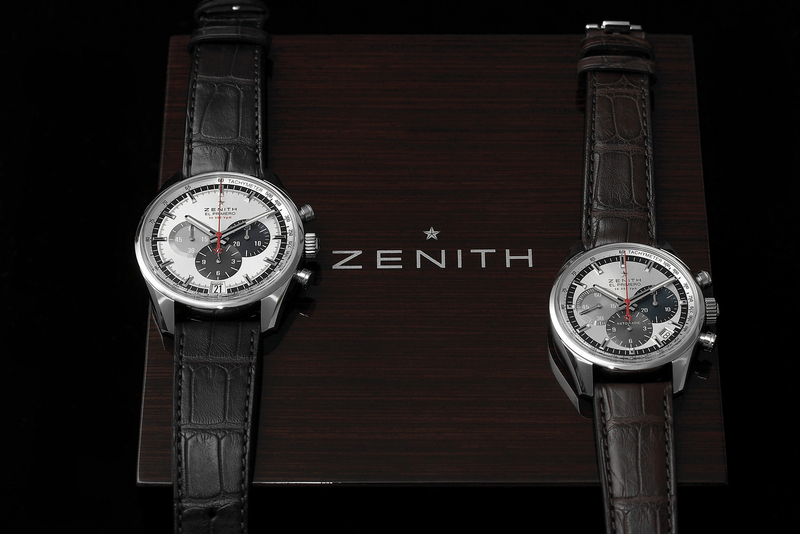 It’s great that Zenith offers two sizes, and I suggest you try both on to see which one works best for you. Previous articleRolexIntroducing the Rolex Milgauss "Z Blue"